Ontem recebi de Leandro 100 gramas de fungo de atta, para que eu possa experimentar algo. Para que ele sobrevivesse a viagem ele mandou o fungo com uma quantidade de operárias para dar manutenção ao mesmo, e assim o fungo chegou bacana. Aproveitei e conectei o pote plástico no qual o fungo chegou a um outro para que elas pudessem coletar comida para o fungo. Yesterday I received from my friend Leandro 100 grams of atta fungus , so I can try something. 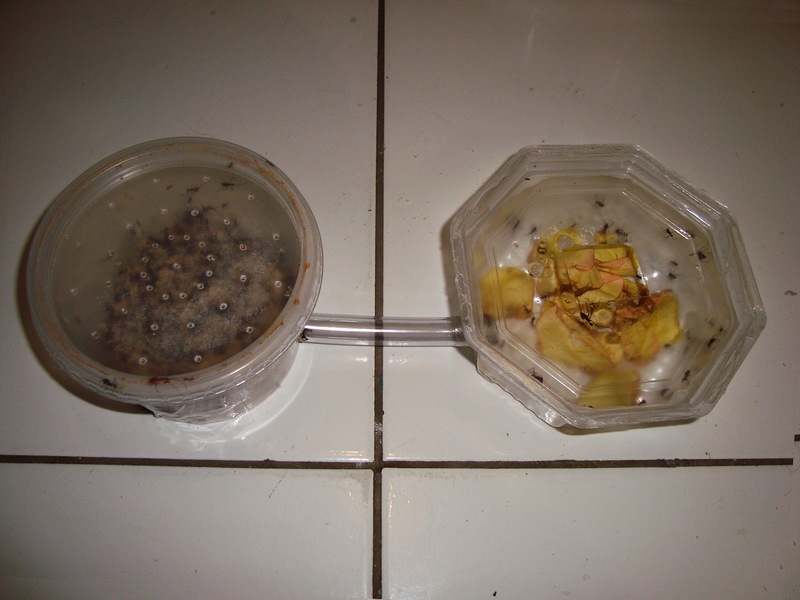 For it to survive the trip he sent the fungus with a number of workers to service the fungus, and so it arrived well. I connected the plastic pot in which the fungus had arrived in another, so that they could collect food for the fungus. 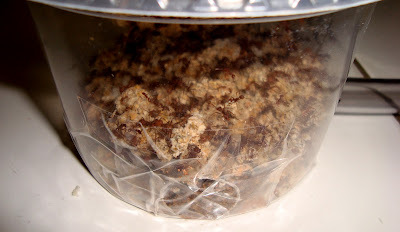 Minha intenção era verificar se a acromyrmex cultivaria o fungo da atta, que é uma outra espécie. Dá pra perceber claramente a coloração diferente entre os dois tipos de fungo. 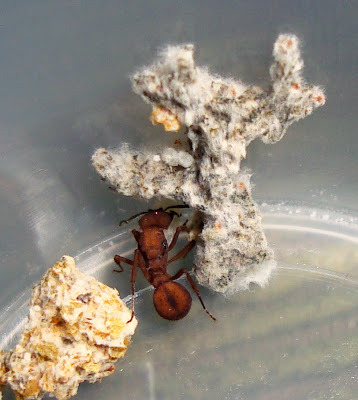 Na foto a acromyrmex já tinha coletado os pedaços de fungo de atta e anexado à sua própria cultura; ou seja... Sucesso total. My aim was to check whether acromyrmex cultivate the atta fungus, which is another species. Can you clearly see different coloration between the two types of fungus. In the photo acromyrmex had collected the pieces of fungus atta and attached to their own culture, that is ... Total success. Uma vez que as questões com o fungo já ficaram claras, decidi fazer algo mais ousado. 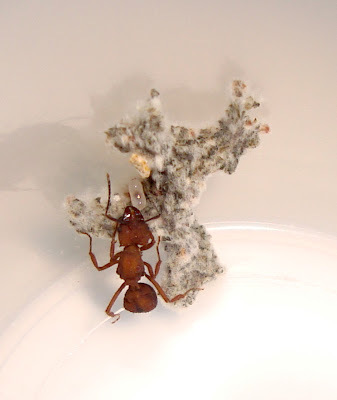 Será que as acromyrmex adotariam as larvas das attas? Coloquei 2 larvas para esta rainha que as rejeitou. Carregou pra longe e largou lá como se fosse lixo. Once the issues with the fungus has become clear, I decided to do something edgier. 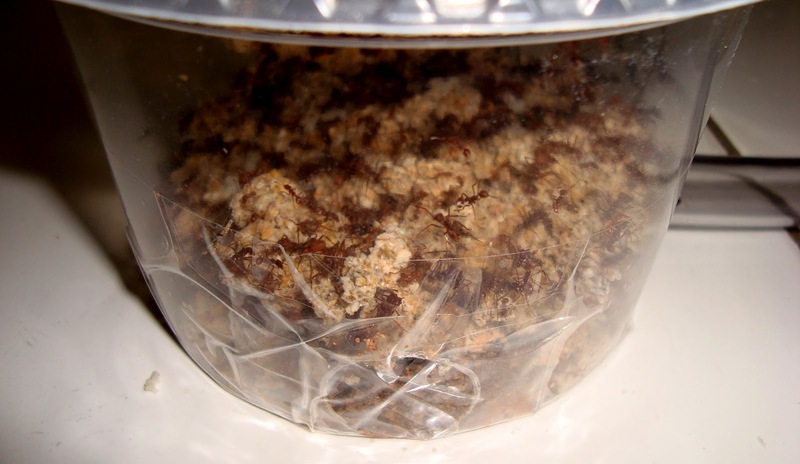 Would acromyrmex adopt attas larvae? placed 2 larvaes for this queen, but it was rejected. The queen carried away the larvaes and dropped there like garbage. 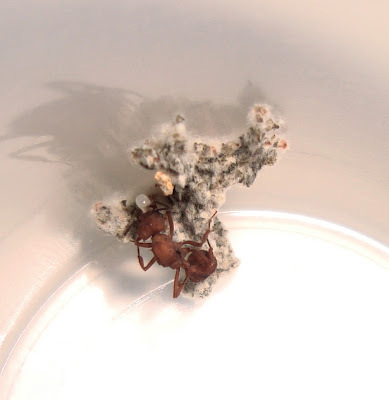 No entanto esta rainha acromyrmex aceitou a larva da atta. Não dá pra aqui questionarmos o absolutismo do instinto? Na foto vemos a rainha pegar a larva do fundo do pote e colocá-la sobre o alvéolo de fungo... Cuidadosamente. However this Acromyrmex queen accepted the larva of atta. an't we begn to question the supremacy of instinct? In the photo we see the queen to catch the larva from the bottom of the jar and place it over the alveolus of fungus ... Carefully. Uma vez que esta rainha demonstrou este instinto materno, ;^) coloquei pra ela 2 das larvas que foram rejeitadas pela outra rainha. 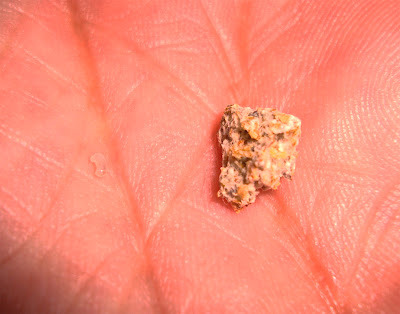 Na foto vemos a mesma colocar uma atta grande num estágio de pupa, num alvéolo inferior, enquanto aparece na mesma foto uma atta num estágio de pupa menor se sobrepondo a larvinha anterior, no alvéolo de cima. 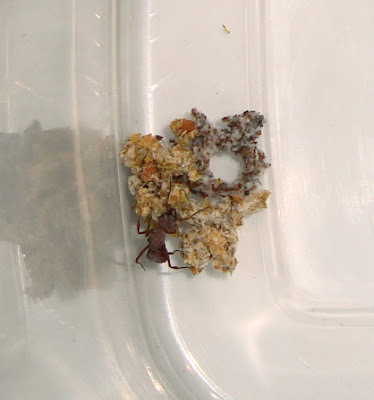 Once this queen showed this maternal instinct, ; ^) I'd put to her two larvae which were rejected by another queen. 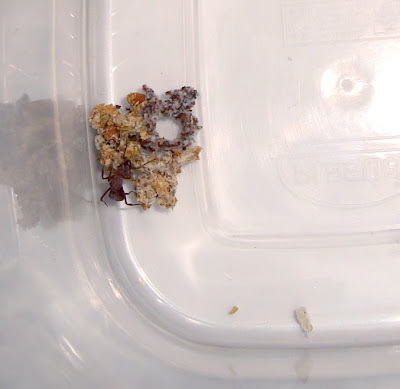 In the photo we see that queen put a big atta in a pupal stage, in an alveolus below, as it appears in the same picture one atta in a pupal stage overlapping the lower little larvae in the alveolus above. Revoada - They are flying! Nasceu! - It was born!